Sometimes in life it takes the realization of the enormity of the problems of the less fortunate in the world to awaken individuals to issues that haunt them much closer to home. The desperation they can see in those less fortunate can often open their eyes to the cries for help that they have until this point either not expressed, nor heard—or maybe even ignored. Georgia is a seventeen-year-old honors student who desperately wants to escape her perfect Pennsylvania town this winter break. She wants to get away from it all and maybe even do some good for others in the process. A flyer on the corkboard at the local grocery store offers the opportunity she didn’t know she was desperately searching for. Georgia's best friend Riley, who longs for escape in general from the ever-present pressure of being perfect, agrees, and the girls sign up for a goodwill trip to Anapra, a squatter’s village on the border of Mexico. While they’re not quite sure where they are going, both know exactly where they do not want to be. Best friends since childhood, they view this trip as yet another adventure of their friendship but also as an escape. Neither girl imagines it may be not only a defining moment between them but also a life or death moment for one of them. Their mission to build something to enable the inhabitants and colorful children of Anapra to have a better life turns into much more. The girls could never dream the trip itself might enable them to not only share what haunts them but maybe even be released from it as well. It is truly the trip of a lifetime—and one after which they will never be the same. National Book Award nominee Beth Kephart has given readers a teenage story of denial and longing set against the backdrop of a place where longing is a way of life. 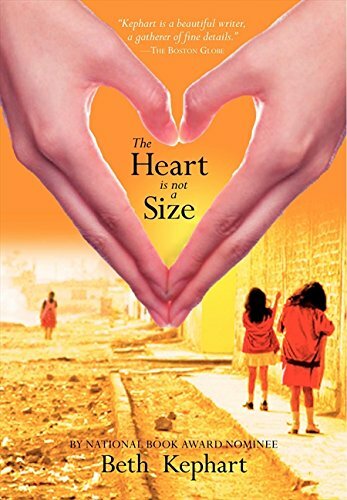 The powers of friendship, community, and self all converge to make The Heart Is Not a Size an incredible read. By showing the powers of denial and secrecy, Kephart also highlights the abundant power of love and friendship. A captivating read for individuals of any age.